I’ve been sick. Started as a little tickle in my throat that eventually landed me in bed for a couple of days and then left me with a lingering cough for the last 4 weeks now! Ugh! 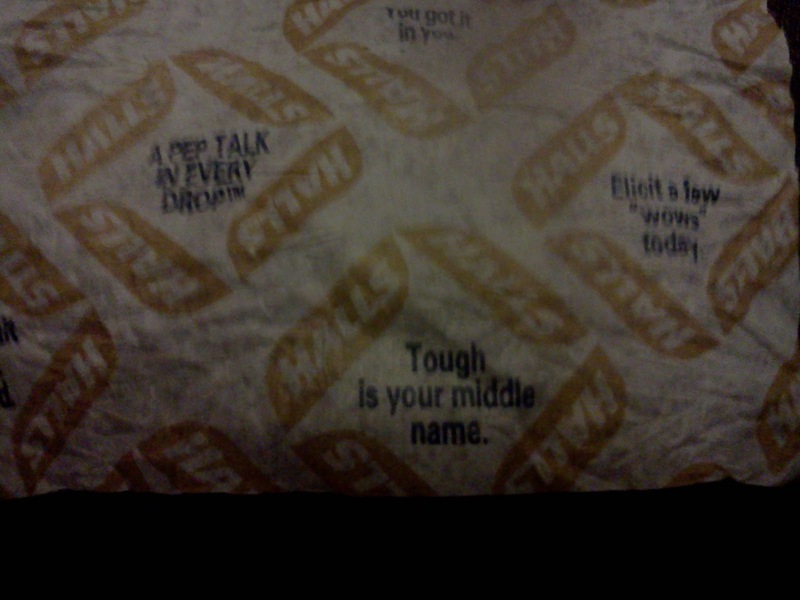 As a result, I have been going through a lot of Halls cough drops in the last few weeks and have been getting a real kick out of their new "Pep Talk in Every Drop" marketing campaign. The wrappers say all these funny things like 'Flex your "can do" muscle', 'Elicit a few "wows" today', 'Turn can do into can did'. Haha! I love it! This is one of my favorites, sorry it's not a great picture. Anyway, back to the real point. The conventional runner wisdom for running while sick seems to be for symptoms above the neck (head cold) run if you feel up to it but for symptoms below the neck stay home. So with a productive cough and a nice rattle in my lungs every morning I figured I should take some time off. Unfortunately this couldn’t have come at a worse time for my training. I was planning on running the Lost Duchman Half Marathon Feb. 20th, this weekend. But due to being sick I missed pretty much the three most critical weeks leading up to what should have been my taper for the race. Oh well. I guess that's not happening. I am still getting over whatever this dreaded gumbo is I caught but when I went to the Dr. last week he said I was good to run. He says even with symptoms below the neck, if you feel like running, run. It won’t hurt your recovery, might even help. I trust my Dr. (and I’m tired of doing nothing) so I am going with it! My training has been a mess due to being sick so I am going to keep my expectations low, but I am excited to put in the distance. This will be my first half marathon and I can’t wait! Tune in March 7th for a race report!